Surprise Medical Bills: Administration And Congress Seek Action : Shots - Health News President Trump said that taming unexpected medical bills would be a top priority for his administration. The sentiment found support from many in Congress. 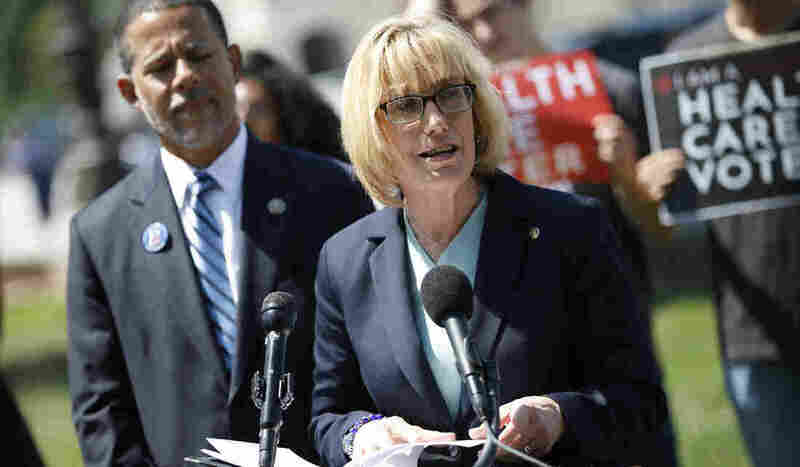 "There does seem to be across-the-board understanding that what's happening to patients right now isn't right or fair," Sen. Maggie Hassan, D-N.H., said about surprise medical bills. Surrounded by patients who told horror stories of being stuck with hefty bills, President Trump recently waded into a widespread health care problem for which almost all people — even those with insurance — are at risk: surprise medical billing. Trump's declaration that taming unexpected bills would be a top priority for his administration echoed through the halls of Congress, where a handful of Republican and Democratic lawmakers had already been studying the problem. The sudden presidential interest has lawmakers on both sides of the aisle expressing optimism about attacking a problem that has affected 57 percent of American adults, according to a University of Chicago survey conducted in August 2018. Sen. Lamar Alexander, the Tennessee Republican who chairs the influential Health, Education, Labor and Pensions Committee, recently told reporters that he expects to see surprise-billing legislation "in the next several months." Alexander is encouraged by the movement, said a committee spokesman — giving a particular nod to the efforts of Sen. Bill Cassidy, R-La. "The chairman looks forward to reviewing their work and hopes it leads to a bipartisan consensus on how to address the issue," the spokesman added. "Indications in Congress have always been that this would be something they could do on a bipartisan basis," said Paul Ginsburg, a health economist at the Brookings Institution. Attention to surprise billing, which involves charging patients for care that is more expensive than expected or not covered by their insurance, has grown following an ongoing Kaiser Health News-NPR Bill of the Month project. Still, the details of a possible solution remain up in the air. The Trump administration hasn't laid out precisely how it would take on surprise bills. But key lawmakers, including Alexander and Cassidy, have met with administration officials to discuss the problem of how to reduce health care costs. Trump administration officials have made it clear that they are looking at surprise billing within this context. And though Senate Majority Leader Mitch McConnell, R-Ky., has yet to address the issue, House Speaker Nancy Pelosi, D-Calif., said it would be a priority. Previously introduced bills would impose new notification requirements, as well as limitations on what doctors and hospitals might charge patients. They would regulate bills for either emergency care at an out-of-network facility or nonemergency care when the facility is in network but the doctor isn't. A bill from Texas Democrat Lloyd Doggett, chairman of the House Ways and Means Committee's Health Subcommittee, introduced during the last Congress with Sen. Sherrod Brown, D-Ohio, would require hospitals to notify patients whether the hospitals — and the doctors and other providers that patients would see there — are in network. Hospitals would also have to tell patients how much they could expect to pay out of pocket. Without at least 24 hours' notice and the patient's consent — or if the patient was receiving same-day, emergency treatment — the hospital would be able to charge the patient no more than an in-network provider would. 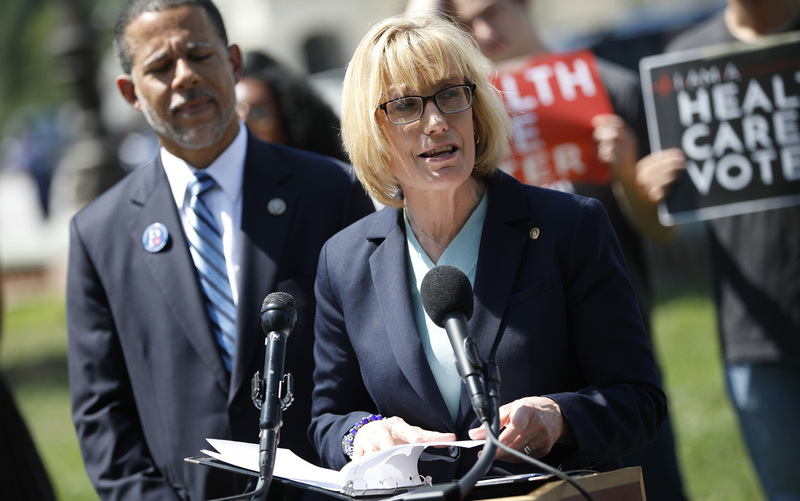 To draw attention to the issue, Hassan intends to bring to this week's State of the Union address a guest who was billed more than $1,600 for a trip to an in-network emergency room. The patient learned after the fact that the doctor she briefly saw there was out of network. "There does seem to be across-the-board understanding that what's happening to patients right now isn't right or fair," Hassan said. Other members of Congress, including Sen. Amy Klobuchar, D-Minn., and Sen. Tammy Baldwin, D-Wis., are expected to bring guests with painful, personal stories regarding the high cost of prescription drugs. Hassan said she hasn't heard from the White House. But as Congress shifts its focus away from the partial government shutdown, she predicted, surprise billing could emerge as a legislative priority. She said that she and Cassidy have coordinated on the issue. Both Hassan's and Cassidy's bills "would go a long way toward protecting patients," suggested Zack Cooper, a Yale University health economist who researches surprise billing. Hassan's legislation, he said, has the additional benefit of likely bringing down health care costs. And federal legislation is likely necessary, experts say. Some states have passed laws meant to curb surprise billing and protect patients from the costs — but those laws don't apply to self-insured large employers, which fall under federal jurisdiction and affect more than 60 percent of people who get insurance through work. The presidential bully pulpit could be hugely influential — in particular, Ginsburg suggested, by "leaning on Congress" to bring legislation to Trump's desk. And new legislation probably is the most effective vehicle. It's unclear what kind of executive action HHS could take without Congress. But reinterpreting federal law would almost certainly invite legal challenges, he added. Already, competing industry groups are lobbying to put their stamp on any federal policy. The emergency physicians trade group has backed an approach like Hassan's, while the insurance lobby is calling for a Cassidy-style bill. When asked about the industry's response, Hassan said she has gotten "a variety of feedback — as you would expect."